You know it’s time for college basketball when March rolls around and spring begins to peak our from behind winters wrath. Spring means it’s time to break out the bracket sheets and party recipes. Today we’re making basketball ice cream cookies! One of these desserts will surely help sop up the tears for when your brackets get busted! Every March we enjoy the last bit of winter snow that moves through and begin to ring in the spring season. This also means college basketball is winding down (or up) to the finals! We’re gearing up for the college bball finals with awesome food and desserts to share at our college basketball watch parties! Today we’re making ice cream filled basketball cookie whoopie pies! Say that 5 times fast! We’re making it easy for you with a delicious cookie recipe and stuffing them with Blue Bunny® ice cream! So if you’re looking for a spring basketball game day treat, look no further, these ice cream cookie sandwiches are exactly what you need. So, what do you say? Are you ready for college hoops? Let’s get this hoppin’ recipe started! Gather your ingredients including white cake mix, Blue Bunny® Mint Chocolate Chip Ice Cream, eggs, vegetable oil, peppermint extract, food coloring, and icing. Find the complete, printable recipe below. We also got Blue Bunny® Cherry Pickin’ Chocolate™ and Bunny Tracks®, but don’t miss out on the Blue Bunny® Homemade Vanilla, Butter Pecan, and Cherrific Cheesecake – and I hear they’re great! Begin by preheating the oven. Mix together your eggs, cake mix, and vegetable oil with a spoon. No need to break out the mixer, a nice stiff spoon will do the job just fine! Add food coloring (make your own natural coloring if you wish). Tint the batter until you have the desired color. I used 4 drops of food gel coloring. Use a pressing motion to get work the color into the dough. Lightly flour your hands and roll the cookie dough into 1½ to 2 inch balls and place on parchment lined cookie sheet. Space the cookie dough a couple of inches apart. Leave enough space to flatten the cookies out, as we’ll be doing that in the next step. I baked six at a time, this recipe makes two batches. Flour your palm or spray cooking spray on the bottom of a drinking glass or other flat object and press the cookies down to about one quarter inch in thickness. Optional: At this time, if you wish you can add orange sugar crystals to the cookies before baking. This will give them extra orange color, crunch and flavor. I added orange sugar to one of the two batches I made. Just sprinkle it generously on top of the cookies. Bake in the oven for 9-11 minutes, cool for 4-5 minutes on cookie sheet, move to cooling rack to cool completely. Note that the edges will just barely brown along the bottom when they’re done, it’s almost unnoticeable. 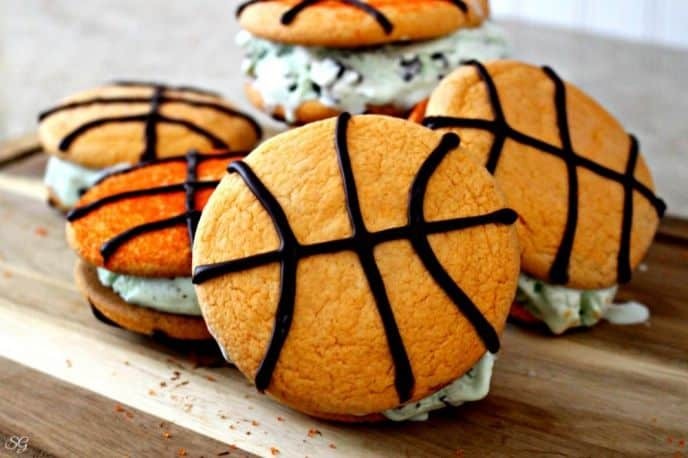 Use black cookie icing to create basketball lines on your cookies. Draw four lines; one across the cookie, one up and down in the center of the cookie, then one on each end with a slight curve to make the basketball design. Allow the cookie icing to set before moving on to the next step. Pro Tip: If you’re not pressed for time, make the cookies the evening before so they have time to cool and the icing has plenty of extra time to set. Once the icing has set, remove the Blue Bunny® carton from the freezer 15 minutes prior to filling your cookies. Flip one cookie over and place a scoop of softened ice cream in the center, place another cookie on top and gently press the cookies together with your fingers until the cookies are filled. Repeat with remaining cookies. Place on a plate (or do like I am, use the cookie sheet) and place them in the freezer until the ice cream in your basketball cookies has had time to re-harden. Now you’re ready to serve at your college basketball game party! Alternatively, if you plan to store them for more than a few hours, place each one in a plastic baggie and store in the freezer. Orange food coloring or gel feel free to make your own organic! Make sure to check out the new Blue Bunny® clear packaging while you’re shopping at Walmart. The new clear cartons allow you to see all the flavor swirls of deliciousness – we used the Blue Bunny® Mint Chocolate Chip for our basketball ice cream cookies. 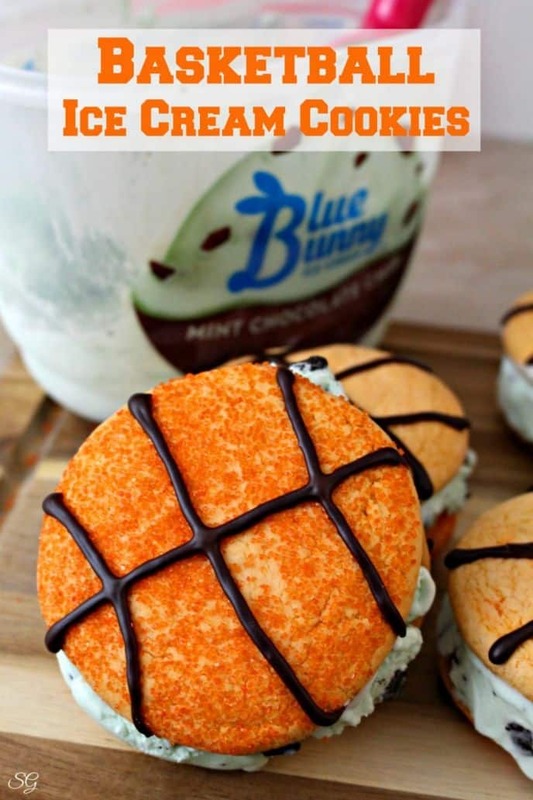 These basketball ice cream cookies are an awesome, easy dessert to serve up after your college hoops dinner – and a perfect treat for when your brackets get busted. Need a printable college basketball bracket sheet? Print it here. How will you use Blue Bunny® to ring in spring?